Featured Length Instructional Video: Golf Coach Craig Foster helps Steve Elkington build an anatomically superior putting stroke through the use of torque in the body. CRAIG FOSTER: What DynAlign is doing is getting the machinery of the human body into a more predictable and efficient address position, so that less can go wrong. And it will start producing more accurate, repeatable shots. And the important thing is to begin with putting. STEVE ELKINGTON: We've all had great feeling over the ball at one time or another. And it uses the bones, the know-how of the bones alignment in our body to be able to create it every time. People may watch this and say, well, I don't need to feel it. I feel good when I'm standing over the putter. They don't have any idea how good they can feel over the putter with this. This is a whole new room inside of your brain that you can lock this down. It's not hard to do. It's simple to do. It's just a few steps. CRAIG FOSTER: There are a lot of good putters out there, and there are people that are excellent putters. But you have those periods where things may be dropping off, uh-- or even if you are a pretty consistent putter, DynAlign can even improve and make you a more consistent putter. STEVE ELKINGTON: Yeah. So we're here today with Craig Foster, who's come down from Seattle to see us. DynAlign-- Dynamic Pre-shot Alignment. And the reason we asked him down is because we know, from looking at his videos on "Secret in the Dirt," that he's got something that we know that we want to find more about. And he's come down to show us today. What is DynAlign? Tell us about, you know, people that don't know you, or don't know anything about what even the subject is. What are we talking about here? CRAIG FOSTER: Slack. It is dynamic pre-shot alignment. And it uses dynamic motion that will occur during a swing, or a putting stroke, chipping stroke, and it will remove a lot of the variables. It's similar to having a machine with moving parts on an assembly line. And when those parts on the assembly line aren't torqued and tightened up a little bit, that machine can start spitting out parts right and left. And DynAlign basically tightens up the tolerances that we have in the bio-mechanism. STEVE ELKINGTON: That was the reason that I was interested. You have this in the video-- right here. STEVE ELKINGTON: You had your bones. Why don't you show what you mean when you talk-- we're talking primarily about all shots, but where I was focusing was putting. And this is video is what I saw that interests me. Why don't you show us what you're talking about here with the arms? CRAIG FOSTER: The ultimate issue on any shot is space, angle, and impact. STEVE ELKINGTON: Space, angle, and impact. CRAIG FOSTER: And so we're making more certain that this angle is going to be predictable and less susceptible to motion. And so the way that it's stabilized-- the bone-- the body can naturally stabilize itself when the leading arm, hand, wrist, forearm, and the humerus bone here are wound forward. STEVE ELKINGTON: To the end point. CRAIG FOSTER: Well, there is-- there's what's called a hard end point, where they-- and we don't want to go that far, because that would-- that could cause stress. CRAIG FOSTER: So you're going to a soft hand range. And what happens in that situation is that the radius and the ulna bones will rotate. And then they come to a point where they become more parallel, and they don't want to go any further. CRAIG FOSTER: Normally, they'll be crossed. STEVE ELKINGTON: Slightly crossed. OK.
CRAIG FOSTER: If your arms are putting, thumbs straight down the shaft, this bone-- these bones are crossed, but they-- so they have all of this motion. STEVE ELKINGTON: Like straight there. They're parallel. CRAIG FOSTER: More-- almost parallel. And in that configuration, then they don't want to easily go farther. And then the other thing that that creates is, that's where the stable arc comes from. Because once this motion has been stabilized, then the arm can swing more on a stable arc. And it's more difficult to get that off of the arc, going outside of it. STEVE ELKINGTON: Sure. It's almost like a train on the track, almost. CRAIG FOSTER: Exactly. Yeah. Traditional alignment, when you have all this motion in play, it's very easy for the club to go outside, inside. STEVE ELKINGTON: Anywhere other than train on the track, right? CRAIG FOSTER: Yes. My history-- I grew up playing on a very old, tight golf course that did not allow slicing at all. If you sliced, you couldn't play. I was a slicer. And uh-- but I don't give up, and so I kept trying like everybody tries. You're looking for tips-- try this, that. CRAIG FOSTER: Maybe work for a little while. STEVE ELKINGTON: How does that look? STEVE ELKINGTON: Does this one cross in the beginning, too? Like, just-- does it have a-- when you hold up the right one, right here, does it-- is this the right one? STEVE ELKINGTON: Does it cross-- not like at its normal-- when it sits there too? CRAIG FOSTER: It's more parallel. It's the opposite of the leading arm. It's a more parallel, and then, as it rotates farther, it becomes crossed. CRAIG FOSTER: And when it becomes crossed, then it's more stabilized up against the lead arm, which is the parallel bones here. I tried everything, and then finally, one day, something filtered into my head about winding forward. STEVE ELKINGTON: Some kind of resistance. Something dynamic. STEVE ELKINGTON: You saw it from then on. CRAIG FOSTER: I got something going here. STEVE ELKINGTON: And what do you have here in these drawings here? This is your-- the sequence of events, obviously, that gets you into a dynamic pre-shot alignment. CRAIG FOSTER: Yes. And we have-- it starts with traditional alignment at the beginning point, where the-- this line is what people commonly-- this is the target line, what's traditional target line. We're going to-- after the procedure, we're going to end up aligned on this line, which is about 90 degrees from the original target line, because there's this rotation moving him to the left. So starting in the end point together as-- the important part is to see-- this is the traditional target line here that people start with lining their club up. After you go through the DynAlign pre-shot, see, we're lined up on this line now, which is here. So we've turned the whole body 90 degrees. And you see, at the address position, we have the straight line from the shoulder down the club-- line of compression, possibly. We have, uh, tilted-- the lead shoulder's a little bit higher, head behind the ball. And the important part is that the bones here-- you can see that the-- they're more parallel in the leading arm, and crossed in the trailing arm that we talked about. STEVE ELKINGTON: --get out there and shoot it. CRAIG FOSTER: And the pointers help people see where, first of all, where the face is pointing. In DynAlign, it's helpful to track where the arc is pointed. 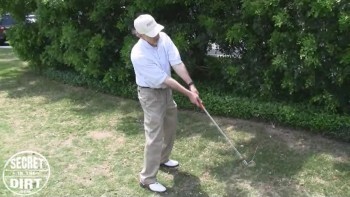 Now, there's a-- Jack Nicklaus has a great video in one of his-- "Golf My Way" or one of those-- where he shows how the baseball arc-- if you visualize a baseball swing here, how easy it is to see that a swing can go below or above the plane. And his suggestion is to get the club up here in a baseball swing, and see that arc. And then put it down on the ground and follow it. STEVE ELKINGTON: You're going to take all that out. CRAIG FOSTER: --rotation and plane. We're going to stabilize it. STEVE ELKINGTON: And is there a preference in-- like, is there a preference in thumb positions, et cetera, that is better-- there is? CRAIG FOSTER: It's your preference. If you want to putt lead hand low, put our lead hand low. STEVE ELKINGTON: So you can do all kinds of things there. CRAIG FOSTER: You can do all that, and go through the pre-shot routine, and then here we are in a stable position. This is very comfortable. STEVE ELKINGTON: Oh, you did? CRAIG FOSTER: Younger. Yes. Years ago, I-- before I had figured this out, I had the yips, and that was another reason that I kept working on this stuff. Um, I was-- if I had an uphill 10, 15-foot putt, it might go five feet right. STEVE ELKINGTON: Oh, so you-- yeah. STEVE ELKINGTON: You had no control. CRAIG FOSTER: No control, because I'm using-- (CLAPS) because I was using traditional thumbs down the center of the putter grip. There's all this motion that can come into play. And boy, when you're putting a ball under pressure or something, man. You-- milliseconds. STEVE ELKINGTON: Yeah. It's not gonna work. STEVE ELKINGTON: That's not gonna work. CRAIG FOSTER: You've got to be stable. STEVE ELKINGTON: You have to have face. You have to be stable. And Craig sent me this in the mail. And this is a ball, obviously, that fits on the shaft here. So you can trap that under your thumb. And you literally, as if you were rolling the ball to the hole. I guess the point of this is, Craig, is, if you had the weight of this ball and you were just going to roll it, you'd very rarely get it wrong for distance. This is my understanding of your concept. And so you applied that into this thing, which was very helpful for my kids, particularly my daughter. Because, you know, they don't quite have a know what they're doing, really. And it's not so easy to explain to them, right? CRAIG FOSTER: The models. Right. STEVE ELKINGTON: They have great touch, but they just don't know how to, um, get it out of them, right? STEVE ELKINGTON: If that was your preference, right? STEVE ELKINGTON: So we loved this, because it's the exact weight of the ball. STEVE ELKINGTON: And then once you've taken it off, and you put your hand back on, you-- you actually sort of have a feel-- it feels like it's still there. STEVE ELKINGTON: And then you just go whoop. CRAIG FOSTER: Remember how it feels in your hand. And there's a variation on the tossing the ball drill, which has been around. STEVE ELKINGTON: --patented idea that helps people primarily-- and only-- with touch. CRAIG FOSTER: --and you can goof it up. But DynAlign also helps keep the club on a path all of back, and it helps the club from going outside too far, from going inside too far. 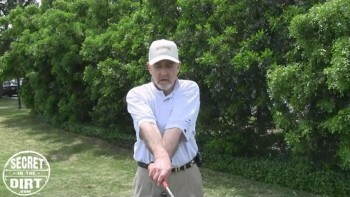 But if I can get you in an address position where we've minimized a lot of the variables, then whatever swing motion you make now is going to have probably more predictable, better results than it did before you did this. STEVE ELKINGTON: So we've already been at the workshop with Craig, and now we're out on the course. So step one in dynamic pre-shot is what? STEVE ELKINGTON: Open up a little bit. CRAIG FOSTER: Don't go to the maximum. It's not here. STEVE ELKINGTON: But we understand-- we understand that we're just trying to get a-- this one's going to be twisted, as you said, and this one-- I think that helps more than anything, right? Because you can-- even though I know I can't see them, I feel like what you say is true. Like there, I can sort of sense they're twisted, and now they're straight there. STEVE ELKINGTON: This is straight, and now that one's kind of twisted. STEVE ELKINGTON: It's a balanced deal. STEVE ELKINGTON: You know, if this was the end end, and that was like-- and I jammed it, that's like a 10. STEVE ELKINGTON: And you'd back off that. Let's say that was the-- I went from, I went from-- as we know, these bones are crossed right now. STEVE ELKINGTON: And this is a zero. STEVE ELKINGTON: And then-- and we went all the way to his maximum, and we call that a 10. STEVE ELKINGTON: You come back to about a eight? CRAIG FOSTER: It would be-- let's see. It's maybe a seven. STEVE ELKINGTON: Seven? And let's say I went to the 10 and I jammed it, and that was a 10 jam, like I jammed it as hard as I could. How much do you back off the pressure of that, too, if I went to a seven? And how much pressure is holding it there? Is it just a very-- is it a five? A four? CRAIG FOSTER: I would say six. A little more than-- little more than half way, you can feel it. STEVE ELKINGTON: So you don't go all-- you go all the way, and come back a little bit, and then just-- and just hold it there a little bit. CRAIG FOSTER: You may have gone to far. STEVE ELKINGTON: Just go to a seven. CRAIG FOSTER: It's a soft end range, so it's-- and you may say on a scale of probably a seven. STEVE ELKINGTON: OK. So it's not jammed by any means. CRAIG FOSTER: It's not jammed. STEVE ELKINGTON: It's just energized a little bit. CRAIG FOSTER: It's just-- yes. Torqued a little bit. STEVE ELKINGTON: Torqued a little bit. CRAIG FOSTER: Torquing this, and putting some-- putting some motion in here. STEVE ELKINGTON: We're taking that slack out. CRAIG FOSTER: In the pre-shot routine, we're factoring in this to our advantage. STEVE ELKINGTON: On the wind. STEVE ELKINGTON: We're calling it a 100% in there. CRAIG FOSTER: It's not as stable. STEVE ELKINGTON: It's got to be to the end. CRAIG FOSTER: If you-- because you're rearranging the configuration of all of the bones, humerus, radius, and the ulna. They're changing. STEVE ELKINGTON: So it's a real bone deal. CRAIG FOSTER: It's a bone deal. That's where our stabilization comes from-- the configuration of the bones. CRAIG FOSTER: It's natural stabilization. CRAIG FOSTER: --for the club. And then this is totally relaxed for feel. STEVE ELKINGTON: I don't want a twist in that. CRAIG FOSTER: Yeah. And that pressure point doesn't come until there's supination. Because that supination will kind of tighten things up here. You're not putting any tension on there with your hands, like grabbing anything. It's when this motion happens, that's going to-- you see how that kind of-- that curls up your little fingers as you turn it. That's where my stabilization is, all in those three fingers. 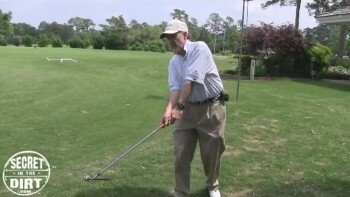 As we wind forward, the club face is pointed into the ground, and to the left of the target. STEVE ELKINGTON: --it doesn't want to go anywhere else. CRAIG FOSTER: Doesn't want to. STEVE ELKINGTON: It's very stable. STEVE ELKINGTON: Everything's-- and that's why I knew that you had something for sure. Now, as we're going to get forward, we're-- of course, we're going to show everyone how to get that back around. So we want them to experience this stability right out of the get go. You'll all of a sudden be making this move, and you're like, wow. That's-- you'll know instantly that this is stable. CRAIG FOSTER: OK. It's hard to go outside or inside. STEVE ELKINGTON: I don't want to-- it is hard to go out and inside. But from my-- what I really like the most is that it won't twist. It doesn't want to do this. Doesn't want to twist. STEVE ELKINGTON: I want to-- if I was hitting a nail, and it was a spike right there, I would-- there's no way for me to miss it. I mean, it would just-- I could just do it all day like a machine. STEVE ELKINGTON: That's what I'm saying. STEVE ELKINGTON: Yeah. I just got too much play, right? CRAIG FOSTER: --motion is there. Now go ahead and wind it forward. CRAIG FOSTER: And now I'll try to twist it. And feel that in your hand. STEVE ELKINGTON: It's just-- it stops it. CRAIG FOSTER: It doesn't want to twist. STEVE ELKINGTON: It won't twist. CRAIG FOSTER: It's very stable right there. STEVE ELKINGTON: And you know, the end product for me was, there was-- you and I talked about this last night. What do you do first? 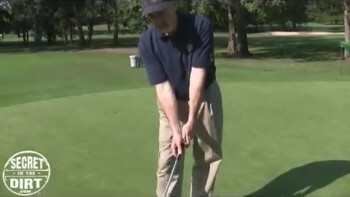 Do you read the putt perfectly? I got a straight, straight putt. I could put a line down. I walk in. I've got the putter face square to the 90, but I can't hit it down the line. STEVE ELKINGTON: Or do you have something that's very stable, and I can-- I learn how to hit a putt with a stable stroke, and then I can knock it down the line. STEVE ELKINGTON: So it's the chicken and egg, right? CRAIG FOSTER: That's the key. You just said it. That is the answer. 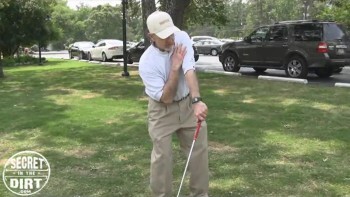 You stabilize your club face, then you align the club face. STEVE ELKINGTON: First, get yourself stabilized, or get your technique. So basically, you're shooting a gun. And then learn how to aim the gun. CRAIG FOSTER: Aim the gun. Exactly. STEVE ELKINGTON: It's a 10 footer, it's a one inch, you know, it's right on the right lip. You set him down, you make the putter straight. Everything's perfect. You move his blade. He knows it's on the right. Everything's perfect, right? STEVE ELKINGTON: But he can't hit it. CRAIG FOSTER: That's it. You aim the drag packet. STEVE ELKINGTON: Well, that's what I think. So Craig, you've shown us step one, where you've moved your feet open. And then you've established to roll this in, and get on that what we call the stable arc. CRAIG FOSTER: Arc. Stable arc. STEVE ELKINGTON: Now what do you do? STEVE ELKINGTON: We real-- we've realized that this is stable. CRAIG FOSTER: This is stable. STEVE ELKINGTON: And we're aimed too far left. And we've got to figure out a way somehow to get it down so we can keep all that niceness feel. CRAIG FOSTER: Yes. Keep this. We're going to-- so from now on, we're not going to do any more-- any rotation of our hands. STEVE ELKINGTON: Hold it at the six and the seven. STEVE ELKINGTON: This is our railway track to [INAUDIBLE]. CRAIG FOSTER: Yes. This here's our railway track. So this is what we want. I'm stepping up to this line. And now I'll do the forward hip thrust right side bend-- forward hip thrust right side bend. STEVE ELKINGTON: Let's see that-- let's see that again. STEVE ELKINGTON: So would you say that the right hip joint goes forward an inch or two? Or what does it do? CRAIG FOSTER: It's basically-- maybe it's-- it's rotating. It's rotating. CRAIG FOSTER: Yeah. We're going here. STEVE ELKINGTON: OK. Well, you've got a little-- you've got a little silver button here, so this may help right here. If I held that button, it goes-- OK. So it went like-- it went like two inches forward and around. STEVE ELKINGTON: Just basically like on a belt line, around two inches. CRAIG FOSTER: We're rotating our-- we're winding our hips forward here. CRAIG FOSTER: We've wound our arms forward. Now we're going to wind our hips forward and do a right side bend at the same time. STEVE ELKINGTON: This collapses down just a little bit. STEVE ELKINGTON: So again, if I put my finger-- go ahead and-- if I put my finger on this-- right on the shirt here, it would drop down. And as it does, I see that this thing starts to swing around, right? CRAIG FOSTER: It brings-- now, when I bend right side bend, it brings the putter back to and level to the ground. STEVE ELKINGTON: Oh, and level to the ground. OK.
CRAIG FOSTER: So that I could put a ball with it. CRAIG FOSTER: So now we've got-- here's the stable arc. We've still got that. And now we've got the putter face on the ground, instead of pointing into the ground. STEVE ELKINGTON: Call them flying wedges. There's two of them. There's a real thin one between the shaft and the back of the left hand. That's one wedge-- like a, like a chock. And then, on this one, there's another wedge there. OK? So that's called the flying wedges. And when you have control of the flying wedges, then the face becomes stable, right? So when I saw you flip over and do this, I knew I had-- the flying wedges were stable. STEVE ELKINGTON: Called him straight away and said, this guy on the dirt-- Craig Foster-- has frozen the flying wedges. Now, you may find this interesting. But when the guys have gone to the claw and all that. STEVE ELKINGTON: --and Terry and I've talked about this, is when they go to the claw and they turn the hand this way, what it does-- upside down-- is they make a big wedge. It's a big flying wedge here. STEVE ELKINGTON: And that flying wedge becomes real quiet to them. CRAIG FOSTER: Some people like it. STEVE ELKINGTON: They do. But what is it doing anatomically is, it's quieting the wedge. There's no more-- you can't tweak-- you can't twitch that. CRAIG FOSTER: Right. It's stable. STEVE ELKINGTON: --you can't tweak it. It's a solid flying wedge. CRAIG FOSTER: It hole-- in the last three fingers of the left hand, that's where the power-- the stability comes from. That's how the bones lock it in. And the other fingers and thumbs can just relax, because it's just the last three fingers in your leading hand that tighten it down. STEVE ELKINGTON: Walk it forward? STEVE ELKINGTON: Are we like a tripod now? We're like in a three-prong, don't want to move anything deal? CRAIG FOSTER: We are-- exactly. We are-- we don't want to move anything here. And we want to shuffle back and align the putter face. So we're going to get back to the target line to the hole by just shuffling our feet, and then aligning the face with our whole body. See, now, I can rotate and change the face in alignment. STEVE ELKINGTON: When you say the whole body, it's everything above the ankle? CRAIG FOSTER: It's everybody-- I'm feeling everything here. STEVE ELKINGTON: It's above the knees. CRAIG FOSTER: We're all connected now. STEVE ELKINGTON: Yeah. Right. You're only one. CRAIG FOSTER: We're all one motion. STEVE ELKINGTON: You're all bolted together. STEVE ELKINGTON: Like a Lego set. CRAIG FOSTER: Yeah. This motion down here will affect motion here, rather than traditional alignment. If we're here, we have all this slack. CRAIG FOSTER: A little torquing. STEVE ELKINGTON: You've lost that. CRAIG FOSTER: I've lost all this. STEVE ELKINGTON: I guess the obvious answer would be if you stood square square traditional, and you got nothing, and you stood your way and you made them, so that's a pretty obvious answer, right? STEVE ELKINGTON: So you got to give this a try, no matter what. Because I don't know one person in the world that cares how they look if they're holing putts. Do you? STEVE ELKINGTON: Yeah. Jack did. I putted open stance, I play open stance. Everything I do is open. STEVE ELKINGTON: Not as important. STEVE ELKINGTON: Straight off of here. STEVE ELKINGTON: Straight sideways of it. So whatever, right? CRAIG FOSTER: But if you don't add some torque to it, you have too many more possibilities. STEVE ELKINGTON: So we've got-- we've got that, that, open. STEVE ELKINGTON: Starting to come around, I'm coming around. CRAIG FOSTER: And everything is stable. The whole body is stable. And I'm aiming the putter face by shuffling my feet-- rocking my feet. STEVE ELKINGTON: We're not moving anything. STEVE ELKINGTON: You're saying, that's where I want to be. STEVE ELKINGTON: Right there. Something like that. STEVE ELKINGTON: Divide the pressure? CRAIG FOSTER: I will step back, re-waggle, redo everything in there. STEVE ELKINGTON: Well, let me be-- let me be more specific. How do you-- if you come in here, and you've got all the pressures-- you got the arm pressure, you've got the hip pressure and the set, you're set, right? STEVE ELKINGTON: How do you get from here to here without losing it? STEVE ELKINGTON: You put the arms in, then is a foot, foot, and you've still got all the pressure. CRAIG FOSTER: No. I would-- once you make your practice stroke, you're getting in here. STEVE ELKINGTON: All the pressure. CRAIG FOSTER: I would move the entire club face with my hand, because then, you can do fine face alignment with the body. STEVE ELKINGTON: Just a little in and a little over? CRAIG FOSTER: It's an arc. STEVE ELKINGTON: And how do you know that you're going to hit it right when it's square? You see this. STEVE ELKINGTON: Is there a ball position concern? CRAIG FOSTER: Well, here-- here's the thing. If we have stabilized the face against rotation, we've created an arc, the relationship of the club face to that arc will not change. STEVE ELKINGTON: So it's perpendicular to the arc at all times? STEVE ELKINGTON: So is this like the-- like the greatest thing ever? In other words, does that mean that your path is-- it's not just a little, minuscule spot to hit it? You could actually hit it on any part of the path? CRAIG FOSTER: You could hit it-- You could. Yes. CRAIG FOSTER: Because the face is not rotating to the path. The face is always square to the path. STEVE ELKINGTON: That's-- that's impressive. STEVE ELKINGTON: Because you're not allowed to move the triangle, right? STEVE ELKINGTON: Hold show, right? STEVE ELKINGTON: More feel back. CRAIG FOSTER: Less loft, if I want to do that. STEVE ELKINGTON: Or you just preferred player's choice of being off the back. CRAIG FOSTER: Yeah. You feel-- you feel comfortable in that position. STEVE ELKINGTON: And what eye-- what eye are you dominant? CRAIG FOSTER: I am left eye dominant. CRAIG FOSTER: So um, the other advantage of having the open stance-- what's called an open stance-- is that now-- and my head is behind the ball. My spine is-- we have secondary spine angle here. Head behind the ball. So now my-- and if I rotate my head on apple on a stick, I'm looking right down the target line. STEVE ELKINGTON: --your foot position that you just sort of nail every time, where it sits in-- do you like it between your feet? Do you like it-- is there a honey hole? CRAIG FOSTER: There's your-- whichever one you like. CRAIG FOSTER: It can be whatever is comfortable to you. CRAIG FOSTER: So no, I don't-- there's no dictation of any specific ball position. CRAIG FOSTER: It's two inches inside the foot. CRAIG FOSTER: Don't need it. STEVE ELKINGTON: You're taking out all the slack, right? CRAIG FOSTER: Yeah, it is. STEVE ELKINGTON: The slack in the sails. Right? STEVE ELKINGTON: You've got the sail on the boat pulled tight right from the get go. You're not waiting for the thing to catch the air, right? It's already pulled tight. So you're ready-- you're ready to race, right? STEVE ELKINGTON: In a way. There's no slack. All the slack's taken out. We're doing that with the structure. Structure of what we have, every one of us has. And that's the bones, right? Bones. CRAIG FOSTER: Yes. Natural-- we're using natural physical stabilization mechanism here. STEVE ELKINGTON: Let's just-- walk us through again. You're already putting these steps that you've shown us how to do it. And there's really no more than this, right? CRAIG FOSTER: No more than that. STEVE ELKINGTON: You're-- you've got the-- you've already put your foot in over here. You've got that. You've rolled that. STEVE ELKINGTON: You just swinging yourself around. You swing into it. CRAIG FOSTER: And the whole time, I'm still focusing on this part of the real estate. STEVE ELKINGTON: Because this is not-- you've taken care of this. STEVE ELKINGTON: Your brain now already knows this is done. STEVE ELKINGTON: Like, a lot of us have problems. We have to get up there and be still thinking about our stroke. You're saying that you don't think about your stroke anymore. CRAIG FOSTER: Not at all. CRAIG FOSTER: I'm thinking about rolling the-- all I'm thinking about is rolling the ball to the hole. STEVE ELKINGTON: Yeah. OK. Because you know you've got something to hit it with. STEVE ELKINGTON: (WHISTLES) Back door is better than no door, right? CRAIG FOSTER: --made that ball go in. CRAIG FOSTER: Because I'm thinking since we're on a level putt here, my distance wall that I'm feeling-- see, I'm-- after I've lined up the putt, I'm just-- I'm looking at this wall, wide wall. And I'm feeling the ball. Because that-- no longer do I have to worry about this line. That line's done. STEVE ELKINGTON: You're done on that one. CRAIG FOSTER: Now I'm just doing this-- I'm rolling up to that wall. You know, I know that this is a flat putt here-- basically a flat, not uphill or down hill. So I know that my target right now is going to be a little bit behind the hole, because that's where I want to get. I don't want to be short. And so I already know that my distance is going to be a little bit behind the ball. And so that-- now we're all alignment. This part is all alignment-- all down the line. That's what we're doing here. We're stepping left, getting-- torquing. Now we're walking in. I'm all alignment-- still all alignment. Still alignment. OK, alignment's done. Now I see my brick wall. STEVE ELKINGTON: And stroke phase. Right? Just bang. 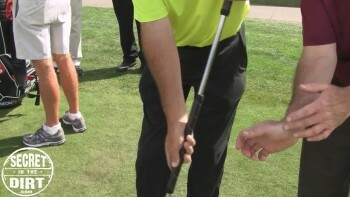 STEVE ELKINGTON: Is the fat grip doing a sort of a DynAlign by freezing the joints into this fashion? CRAIG FOSTER: It's the opposite. STEVE ELKINGTON: Very bad, yeah. STEVE ELKINGTON: But it's still in the same vein of just locking stuff down. CRAIG FOSTER: It's trying-- it's trying to remove this. CRAIG FOSTER: Trying to take the wrists out. But it robs you of feel. CRAIG FOSTER: Your-- you know, the brain surgeon, when he goes in with the scalpel, doesn't have a big baseball bat handle on it. He's got this. CRAIG FOSTER: Because that's where the feel is. And we-- so we're activating all that. CRAIG FOSTER: Yes. The right touch. STEVE ELKINGTON: Which is just like rolling the ball, right? CRAIG FOSTER: It's just like rolling a ball. STEVE ELKINGTON: Except for I'm gonna roll these ball-- you know, the weight of this, you know. Very rarely do anyone-- you know, does anyone ever get this way off, right? As far as touch. STEVE ELKINGTON: It's just natural, right? CRAIG FOSTER: Yes. Because you'll see-- sometimes you'll see players hold a ball in their hand. CRAIG FOSTER: When they're waiting to putt. And they'll hold it in their hand like this. So I'm going to hold that ball just as if I were going to roll it. I've got it in my hands just as if I'm going to roll a ball. And I can use my normal putting grip on there. STEVE ELKINGTON: And then you just-- you just imagine that-- you look down there like I just threw those, and-- or rolled those, and you just feel the same thing. 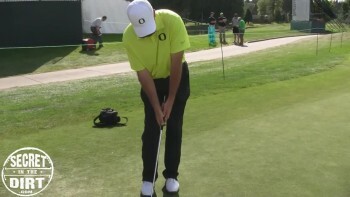 STEVE ELKINGTON: Putter head move. Yeah. CRAIG FOSTER: The putter head move. OK, we have gravity is hold-- is holding this steady. I'm not doing anything, but gravity is holding it steady. I have to decide how much force to break gravity to make my back swing. And the sensation of the mass of this ball in the hand tells the neurological system how much force is necessary to break gravity-- to make a stroke. CRAIG FOSTER: OK. So I'm visualizing the distance. And when I-- I'm visualizing a wide wall this way for distance control. I'm not judging my distance by looking down this line. I want to see a wide wall, because then I-- it's a bigger target. And that's distance-- distance is this way. Distance is-- distance control is not-- that's an infinite line. That keeps going. That doesn't tell you a lot. When you put it underneath the left hand also in practice, it just sensitizes the left hand to the motion that we're making. STEVE ELKINGTON: It may feel better. CRAIG FOSTER: It may feel better. STEVE ELKINGTON: So the player's choice, right? CRAIG FOSTER: Yeah. Player's choice. STEVE ELKINGTON: So we're going to see your routine and, you know, if-- you're already doing-- you're already doing something up here, it looked like it took a bit of work out of there. But you're going to show us how to blend it. CRAIG FOSTER: Oh. Blend it. STEVE ELKINGTON: You've just hit it on the green. You've hit a nice shot, and you've coming in, and you've already started winding. We're going to see you blend the whole thing. You already started to move to the right and twist in. And you shimmy everything around. That ball-- I could see that little black line on that ball just tracking right up there. You're already walking in to the left. You've already started shimmying around there. It's real stable. Just not wobbling around any. CRAIG FOSTER: It's wobbling from my coffee. STEVE ELKINGTON: Yeah. Wow. Wow. That was tight. That was nice, Craig. Think I want a foot back. STEVE ELKINGTON: And just throw it all over, keep the integrity. CRAIG FOSTER: I'm right side bending. STEVE ELKINGTON: Right side bending. CRAIG FOSTER: Also a little forward hip thrust. STEVE ELKINGTON: And see, the pointer's way left still. STEVE ELKINGTON: You're like a-- you're like a fridge. I'm kind of rocking you around, because we can't move anything other than the whole show, right? Now you're-- you're sort of in the game now, right? STEVE ELKINGTON: You feel you've got yourself a round there. Boom. CRAIG FOSTER: So we want to use our starting position, and this is the line that we're going to end up on. But the pre-shot is going to take us away from that line. I'm stepping back with my leading foot. And now I am winding forward so that the putter is into the ground and to the left of the hole. And now, as I wind back my whole upper body to the target line, keeping my leading hip with some tension in it. And now I'm going to walk this back and align it with my entire body. I'm moving that face by rotating my entire body, and not my hands. I'm going to step back with the leading foot, wind forward with the hands, club face is down into the ground to the left, and I'm going to right side bend a little bit. And then hold that, and use my feet to shuffle back into align the face with my entire body. Like that. STEVE ELKINGTON: When does-- how long is that? Does that come pretty quick usually? CRAIG FOSTER: You know, it-- it depends on the person. Some people are more mechanically adept, and they have-- their mind is-- uh, they have mechanical aptitude. And they can get it really quite quickly. Other people learn in a different way. And so everybody learns things in a different way. And so hopefully-- some will take longer than others. But, uh, just know that if it is difficult at first, you may be doing something that needs revision. STEVE ELKINGTON: Not-- yeah. Not precise. STEVE ELKINGTON: Once you get it, it's locked down. CRAIG FOSTER: --a traditional alignment. STEVE ELKINGTON: So I'm going to give my interpretation. STEVE ELKINGTON: Right off, you know, right out of the gate, we've got, you know, I just-- I'll bring these together. I'm gonna grip down on it a little bit because-- give me a little bit more room there. STEVE ELKINGTON: I'll get better. CRAIG FOSTER: Slide that in there. STEVE ELKINGTON: --won't happen again. STEVE ELKINGTON: It won't happen again. OK, so I got that in there. I got that. I'm going good, right-- I got that? CRAIG FOSTER: You're-- you're there. STEVE ELKINGTON: I'm coming in, and I'm going to swing this one this way, right? CRAIG FOSTER: You're going to keep your torque that way. STEVE ELKINGTON: Got my torque. And then I'm going to start dropping in-- dropping in. Right? STEVE ELKINGTON: Start dropping in, keep moving around, keep moving around, dropped in, dropped in, dropped in. I feel pretty locked down right here. CRAIG FOSTER: You look pretty darn nice. A little open stance. STEVE ELKINGTON: So I've got your deal. I've got it wound forward. And as we say it, I wound everything with it. CRAIG FOSTER: And that's where this hip rotation came from. STEVE ELKINGTON: I sort of locked it. STEVE ELKINGTON: It won't go much further than that. So I kind of walk in but it's-- I've kept it there. Now, once I get to here, then do I swing it around? CRAIG FOSTER: Yes. Then-- you've still got torque here. So you're turning the whole thing. STEVE ELKINGTON: Yeah, I got it now. CRAIG FOSTER: We turned it counter-clockwise to lock in. Now we're aligning, because everything is going to turn now. STEVE ELKINGTON: You go maybe 70%, 80%? CRAIG FOSTER: Soft hand rein. STEVE ELKINGTON: Just hold it there. STEVE ELKINGTON: I feel it. I've sort of felt like everything's turned all the way. STEVE ELKINGTON: And then I sort of just leave that in a torqued feel. STEVE ELKINGTON: And then I just come and drop it in. CRAIG FOSTER: All is one piece. So nothing is moving independently. Your upper body isn't moving all separately. CRAIG FOSTER: All together. And it's-- and that's why the final alignment is kind of rocking on the feet. STEVE ELKINGTON: To get around. CRAIG FOSTER: Because I'm-- everything is one piece. STEVE ELKINGTON: Yeah, right. I've got that, and I'm gonna got that. There. I've got that torqued in there still. STEVE ELKINGTON: And I'm just going to drop down. But I still kept the torque this time. STEVE ELKINGTON: That sort of got-- this is just as important. STEVE ELKINGTON: Do you leave that wound and just drop the top lot? CRAIG FOSTER: Yes, yes. Yeah. STEVE ELKINGTON: I see it. CRAIG FOSTER: There you go. That's a nice looking setup there. STEVE ELKINGTON: It's so draggy. CRAIG FOSTER: Nice looking setup. STEVE ELKINGTON: So let me just clarify that if I can, Craig, let me just-- I want to confirm a couple of things with you, OK? STEVE ELKINGTON: So when people get this tape and-- I've got that. That's an easy one to get. That's very understandable. STEVE ELKINGTON: And I also want everyone to realize that I've wound that one to an end-- end feel. STEVE ELKINGTON: I've still got it wound, OK? STEVE ELKINGTON: Almost like stiff legged. STEVE ELKINGTON: --for the camera. Now, I'm gonna leave that there, I'm gonna-- look at me. I'm gonna cut that off. STEVE ELKINGTON: I'm gonna leave that wound-ness there. STEVE ELKINGTON: And I'm going to just drop this against the back of it. Is that right? CRAIG FOSTER: You want to feel some-- little bit. STEVE ELKINGTON: --for going that way. STEVE ELKINGTON: That's a crazy roll, isn't it? CRAIG FOSTER: With DynAlign, some of the-- a lot of the game improvement type designs with extreme perimeter weighting can mask the feel. You can use extra large putting grips, but those mask the feel as they're taking the wrists out. 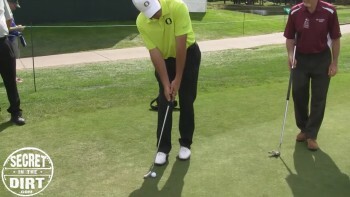 With DynAlign, you can use a putter that has a smaller grip for good feel, and not excess perimeter weighting. You know, you don't want to use an antique, necessarily. You don't watch black and white TV anymore, either. STEVE ELKINGTON: Yeah, you want something with a nice sweet spot. CRAIG FOSTER: You know, get something with alignment on it. But it doesn't have to be some extreme game-improvement club that's going to mask your feel. You want a player's club that you can get some feel. And DynAlign allows you to be stable in your alignment and still have a very good feel with your hands. CRAIG FOSTER: Now the idea is to make it stealth, so that you can go out and do this, and nobody is going to say anything. STEVE ELKINGTON: Oh, camouflage, right? STEVE ELKINGTON: I would come out of here, and I've got that. And I would just put all that in there. CRAIG FOSTER: There you go. There you go. STEVE ELKINGTON: Keep that. Let's keep that. And then just drop that against that. And basically, I could leave my-- I could almost leave my stance wherever I wanted to. CRAIG FOSTER: --against them. I feel my hips go-- as I drop down, I feel my hips go a little bit forward. See? CRAIG FOSTER: A little bit forward here. STEVE ELKINGTON: So let me ask-- let me see if I can show this somehow. Well, I got this cup right here, and this is my hips. And they're wound-- they're wound there. OK? STEVE ELKINGTON: I cut myself off there, and this is my-- I just drop down against that, still wound. Is that right? I just pshh. Yeah. So I put that down and cut myself in half. CRAIG FOSTER: Yeah. Yeah, there you go. STEVE ELKINGTON: Drop down against it. That's hit well. CRAIG FOSTER: Little bit speedy, that one. STEVE ELKINGTON: Little bit speedy. I'm just trying to get-- uh, I'm just trying to get orientated. CRAIG FOSTER: Yeah. There you go. Like it. STEVE ELKINGTON: What I like about this is, players don't-- you don't have to worry about your, you know, everything being lined up parallel and all that kind of thing. It's a real dynamic, right? It's the name of the business. Maybe your company. It's-- it's dynamic! CRAIG FOSTER: Yes. Because after we've done that, we're aligning the face by moving the rest of the body. It doesn't matter where your shoulders are. STEVE ELKINGTON: Where-- where's the pitfall? Where do you-- where are you likely to lose it? STEVE ELKINGTON: Drop out there. CRAIG FOSTER: --here. Drop out there. STEVE ELKINGTON: So don't drop out. Stay on the endpoint. STEVE ELKINGTON: So I feel it now. CRAIG FOSTER: Feel firmness here. STEVE ELKINGTON: Now I feel-- I feel good there. That was nice. CRAIG FOSTER: Are you feeling the stability here? STEVE ELKINGTON: Yeah, I am. CRAIG FOSTER: And are these relaxed? CRAIG FOSTER: Very relaxed for feel here. STEVE ELKINGTON: It's almost like the whole show is happening from these top three fingers. CRAIG FOSTER: These top three fingers, when the configuration of the bones will firm up the grip. So that's what your stability-- this is your feel. STEVE ELKINGTON: You couldn't get those off of there. CRAIG FOSTER: I can see white. STEVE ELKINGTON: Yeah. You wouldn't get those off of there. CRAIG FOSTER: Soft hands here. STEVE ELKINGTON: I've got a little bit of pressure on these other two here. STEVE ELKINGTON: But not like the backs are. CRAIG FOSTER: --is fully-- you have-- you're fully sensing. CRAIG FOSTER: You're fully sensing that. STEVE ELKINGTON: I feel like it's just holding it, and it's just going to be like a concussion, like a-- just, it's just something's that's going to be just purely swinging and hitting the ball. CRAIG FOSTER: You're even more stable. STEVE ELKINGTON: I'm gonna drop down, and I'm just gonna make this stroke. And move in, and then I'm-- now I'm gonna fridge it, get fridgerated around. CRAIG FOSTER: Down in the hole. CRAIG FOSTER: OK, now how about this? STEVE ELKINGTON: That's incredible feel, right? CRAIG FOSTER: How about this? Go back and putt the way you did before with-- don't do any of the DynAlign now. STEVE ELKINGTON: No, I don't want to do that. STEVE ELKINGTON: I've been doing that for years. CRAIG FOSTER: OK. (LAUGHING) Sorry. STEVE ELKINGTON: Hey. It's taken me a long time to get here. I really don't want go back. STEVE ELKINGTON: Let there, huh? CRAIG FOSTER: I like that. I like, I don't want to go back. That's a good quote. STEVE ELKINGTON: If I were gonna come around, I'd go with the fridge, and keep the torque. Go with the fridge. CRAIG FOSTER: Yes. Keep-- yes. STEVE ELKINGTON: Keep the fridge in play. CRAIG FOSTER: No independent motion in your hands, wrists. STEVE ELKINGTON: You have to make those little bits at the end. STEVE ELKINGTON: The millimeters you do with the ankles. CRAIG FOSTER: With the ankles and your entire body. CRAIG FOSTER: I think it's rolling. Loved that address. It just looks-- it looks dynamic. You're in motion. You're no longer standing there with square feet, hips, and shoulders in a static position. You can make putts that way. But you're in a dynamic position. If anybody out there has yips, I've had yips when-- years ago. STEVE ELKINGTON: You don't have yips now. CRAIG FOSTER: --would say I have anything that resembles a yip. STEVE ELKINGTON: I don't think you could do it with DynAlign because you've got the-- the bones are right. The bones-- it's the alignments. STEVE ELKINGTON: That'd be a good one. CRAIG FOSTER: --who have yips, because I know there's some out there. Uh, give DynAlign a look. Because, uh, I feel pretty confident that I can cure your yips permanently. CRAIG FOSTER: No training aids. STEVE ELKINGTON: No training aids. No. CRAIG FOSTER: No braces. You don't have to use-- you don't have to use gimmicks. CRAIG FOSTER: You just have to know how to use the body's natural stabilization. STEVE ELKINGTON: This is where I started today, you know. Started today like everyone's gonna start. I'd turn that one over, turn the body over. Real wide-- you know, real stance. And then I come around, still keeping the weight there, twisted there. That's very important. STEVE ELKINGTON: You have-- it's hard for you to believe this, but these little inches of holding these torque are so important to make or break this deal. STEVE ELKINGTON: So that's there. And then I come around, and I come around, and I come around until now. Now, I'm just relaxed. I'm just going to do it now this time without straining anything. CRAIG FOSTER: Bingo. There it is. There you go. STEVE ELKINGTON: Can't-- just can't not hit that ball perfect right here. It's impossible. STEVE ELKINGTON: Give you one of these before I go.